Edison Lanza has been the special rapporteur for Inter-American Commission on Human Rights’ Freedom of Expression since October 2014. 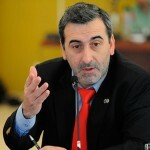 He is an Uruguayan lawyer who graduated from the University of the Republic’s School of Law. Besides working as a journalist for various media outlets, Mr. Lanza has brought cases before the Inter-American Commission on Human Rights pertaining to the right of freedom of speech and expression and has unified, directed and founded several NGOs which work tirelessly to defend said right. Mr. Lanza’s graduate studies at the University of the Republic focused on Freedom of Speech and Criminal Law. He obtained his Ph.D. at the University of Buenos Aires’ School of Arts & Sciences where his dissertation focused on the processes regulating and censoring audiovisual media in Latin America. Edison Lanza is the co-founder of the Center for Archives and Access to Public Information in Uruguay. In addition, he is also responsible for the merger between the Regional Alliance for the Freedom of Speech & Information’s Committee on Freedom of Expression & Access to Information and the IFEX-ALC Alliance for the Protection of Freedom of Speech. Mr. Lanza has also offered his services as a consultant to various countries who wish to develop bills related to access to public information, freedom of speech and expression, and freedom of the press.